An umbilicus is an origin, the place at the middle or beginning of something larger. For humans it is another word for our navel. The navel is the point of expansion for your body, where it gained sustenance as you grew in the womb. For coiled molluscs such as snails and Nautilus, the umbilicus is the hole at the centre of its shell whorls, the axis of its coils, effectively the place where the coiling growth began. My origins are in an old place. 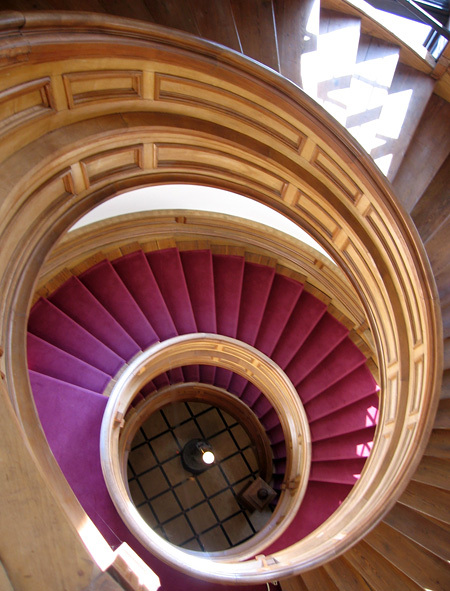 In the middle of that old place, most appropriately, is this uniquely beautiful open spiral. The umbilicus of the town and the province. 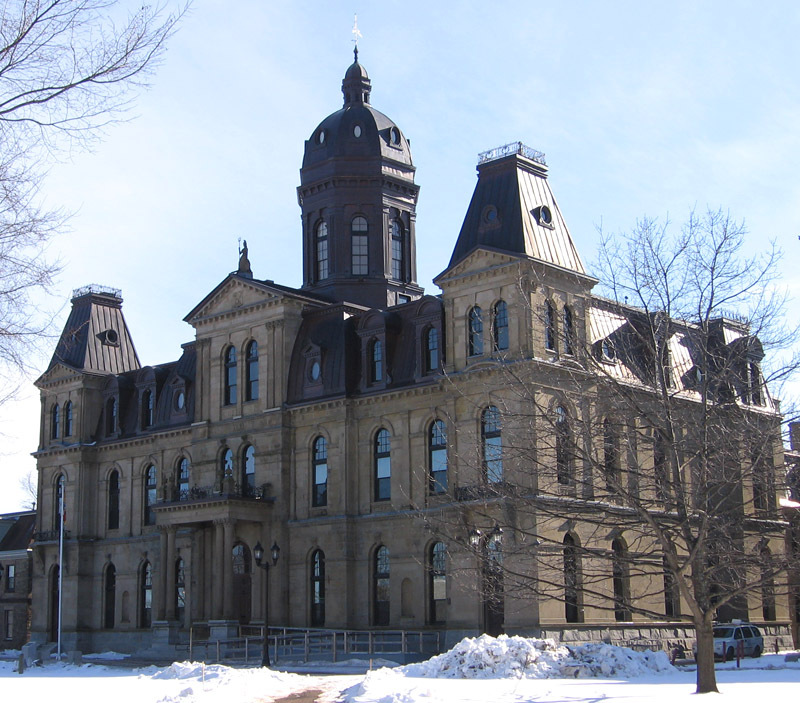 The New Brunswick Legislative Building was constructed in 1880. In the centre of a place built on lumbering and shipbuilding, it is only reasonable that the heart of this building should be wood, unlike the hearts of stone in western Canada. The spiral at its core is wood also, ash and walnut. Standing in this spiral, I feel as though I am inside the shell of an enormous gastropod, the ancient varnish glowing in the sun like luminous nacre. This spiral is a complex, wonderful thing. 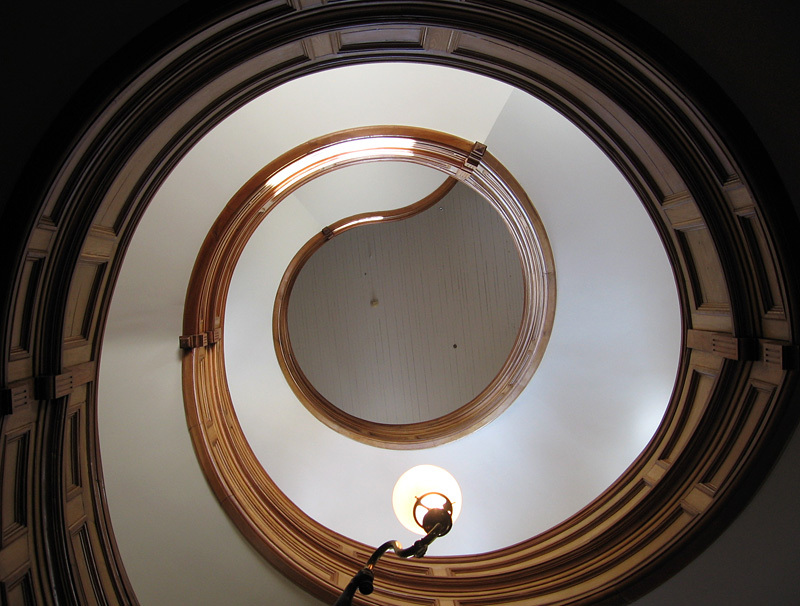 Once you have examined it for a while, you realize that it is quite asymmetrical, oval rather than circular in plan view, the horizontal landings incorporated without any break in the curvature of the central handrail. 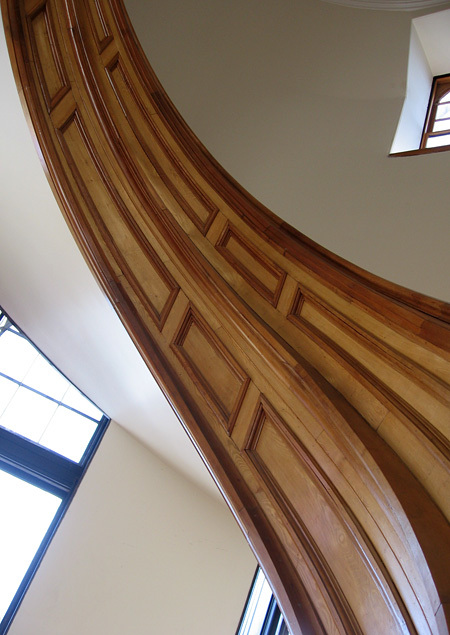 It is the sort of mathematical form that we are used to now, as we spend time in modern buildings where complicated three-dimensional structures have been created with computer assisted design. But how was this done in 1880? 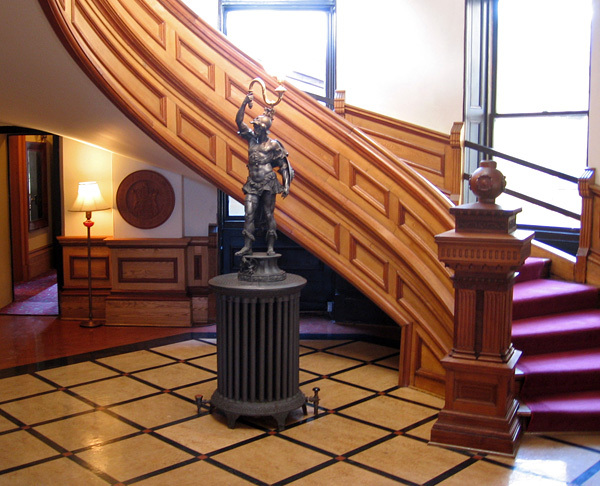 The building was designed by J.C.P. Dumaresq, an architect who created many other important buildings in the nineteenth century Maritimes. 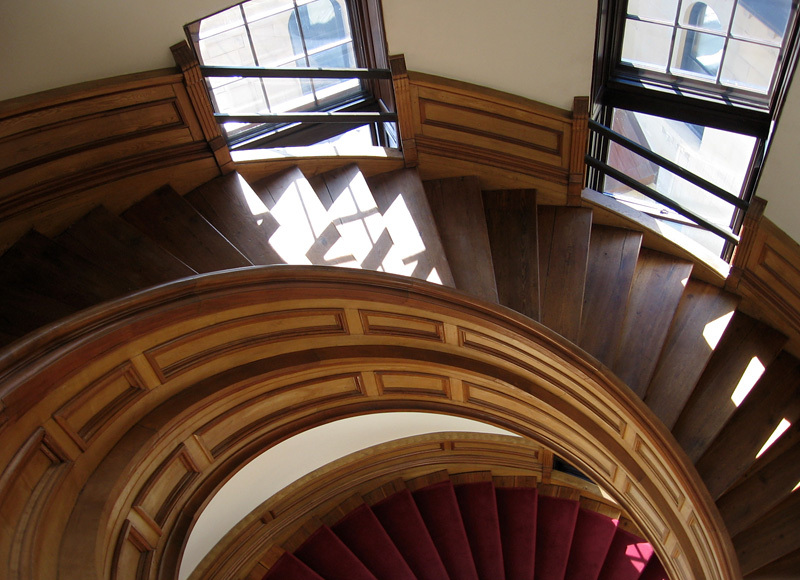 Since he was a Nova Scotian born in Sydney, I am tempted to speculate that this staircase was inspired by the spiral that can be seen in an abraded snail shell on the beach, or maybe by a whelk’s egg case. I also suspect that some of the form of this coil may have come from the minds and hands of the highly-skilled carpenters, of whom there were many in New Brunswick at that time. 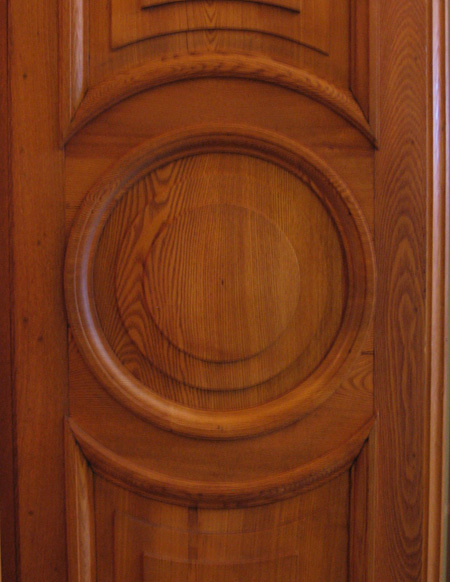 Perhaps the spiral was suggested by New Brunswick’s fiddleheads, which turn up in many other places as symbols of the province. 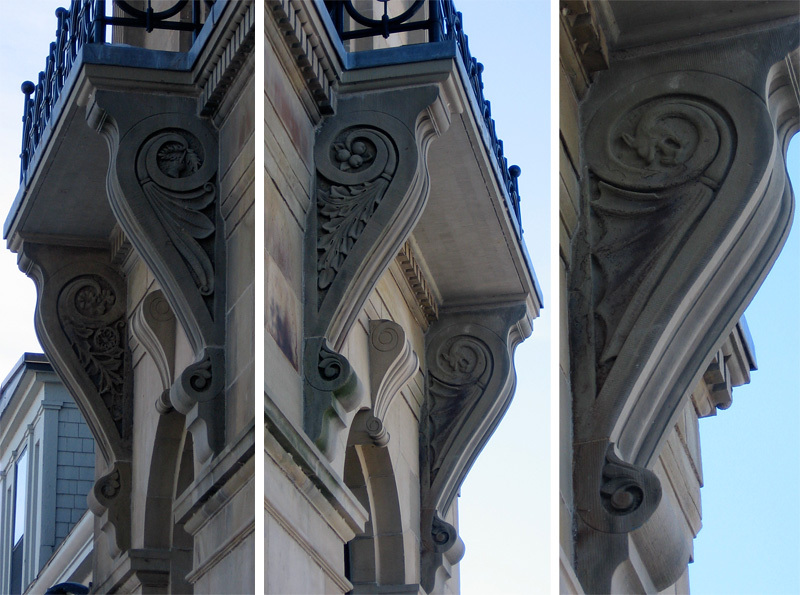 On the front of the building, a series of fiddlehead-form brackets support the little balconies. Looking in detail, I realized that each of these has different decoration and depicts a different organism; I am particularly fond of the dragon bracket! These fiddleheads are close to being logarithmic spirals, like Nautilus shells. The staircase (being a staircase) is not, but its complicated form is far beyond my extremely limited mathematical understanding. I can only contemplate and wonder. Umbilicus. 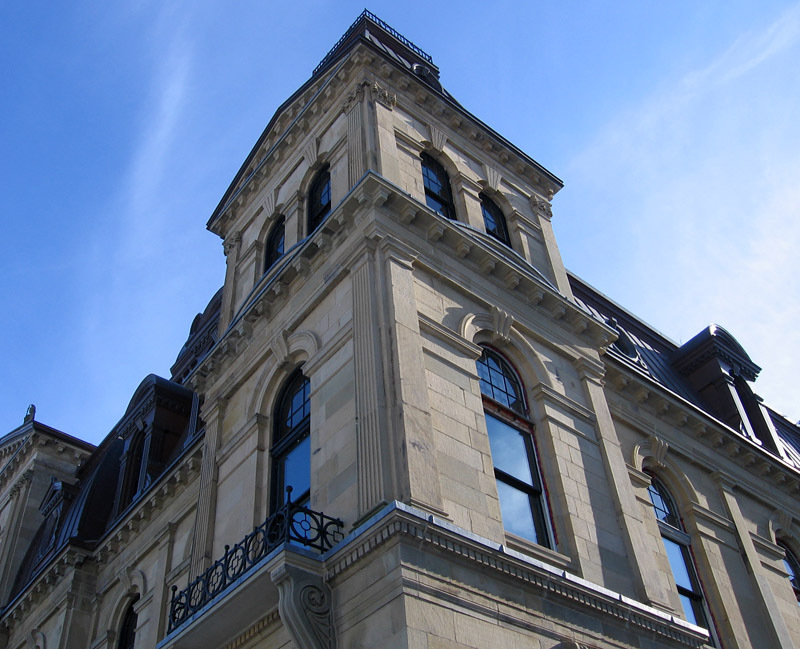 Overall, the exterior of the building is an elegant and coherent piece of Second Empire style, executed in fine sandstone. I will try to discuss its geology in a future post! If you wish to learn about the man who designed this building, please read my sister’s fine article in the Dictionary of Canadian Biography.